I told you I was obsessing about the circle thinlit die, didn't I? well, I used similar materials with it again, to make an engagement card this week. I used the same idea about how to make images meet when the circle flips to make this card. Aren't they little birdies the cutest?? They actually kiss!! I used clear embossing powder over the Rich Razzleberry cardstock to make them shimmer and have a little texture then added a little black pearl for each eye (non SU!). I just thumped my Versamark pad all over them then added the ep, and heat set it. 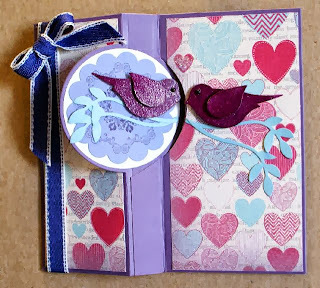 There's an image from the Daydream Medallions behind the birdie on the left and behind the greeting of the front of the card (that sentiment is a retired stamp though). I used some Bashful Blue cardstock to make the leaves but it is a retired colour now. You could substitute Pool Party or Soft Sky cardstock though, right? Wait till you see what I am making for my BIL's 60th birthday.There are no birds and hearts on THAT card. Circle Thinlit Card for a 60th! 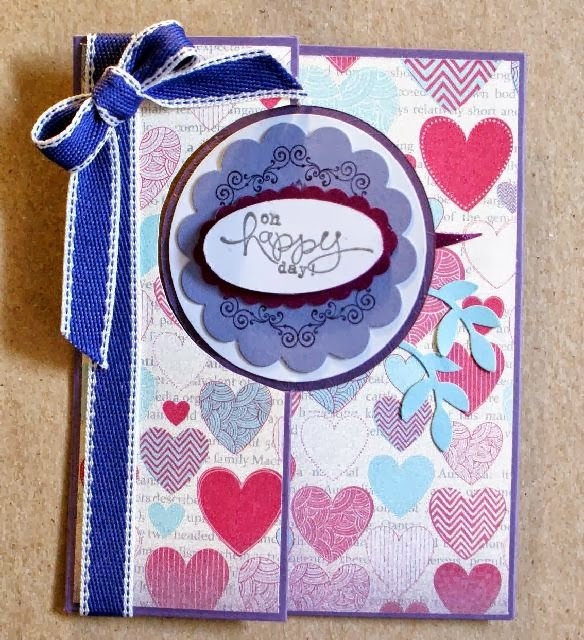 Happy 25th Anniversary, Stampin' Up! It's ending in 24 hours!!! The Join Stampin' Up! for $25 started TODAY!